Being a mother has a lot of different job descriptions. Not only am I the caretaker for my children but I am also a wife, a housekeeper, referee, launderer, dishwasher, decorator, teacher, mess cleaner, cook, organizer, and comforter to my family. Lately I have really been trying to stay on top of everything and do my job well. I want my husband, my children and God to be pleased with me. I really want to be faithful with all God has given me and if I am brutally honest part of me wants my husband, my children and the world to see that I can do all these things... and do them well. 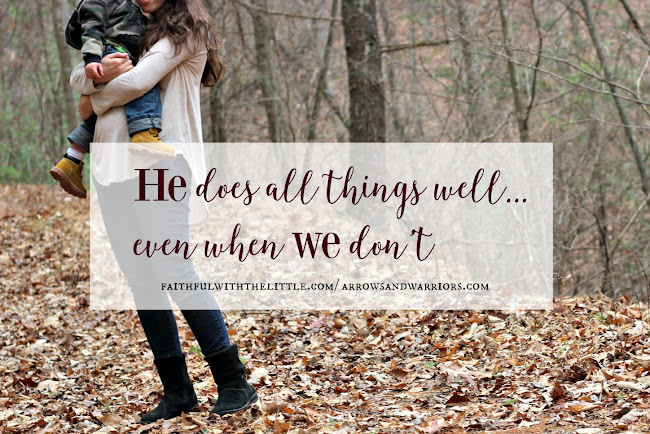 Read the rest of the post over at Arrows and Warriors! Your right! There is no way that we could do it on our own! So thankful he is there to pick us up when we fall and carry us when we can't walk! Beautiful post - I'm so thankful for the Lord - He makes up for all of my shortcomings... and more! He is always there and always ready to help when we call on Him. Thank you Jennifer! Yes, he is so faithful! So beautiful! Every time I come to your blog, I am drawn to the words and beautiful design. Thanks for your encouragement. This was an inspiring post! Being a Mama is tough. The one thing I would love all Moms to rest in is the fact that Jesus fills our gaps. We cannot be all and do all. We are humans and we must take care of ourselves to make it the long haul ... and to live out a faith that says "I can let go and let God". This was a beautiful post! Thanks Lori!So true, love this--->Jesus fills our gaps:) Thanks so much for your comment. Have a great weekend!